*Disclaimer - I received the product in this post from Sony Pictures Home Entertainment, in order to facilitate this review for my readers. The wonderful world of Teletubbies is back with 6 all-new adventures for your little ones when Teletubbies: Follow The Leader arrives on DVD on September 5. Our toddler loves the two DVDs that we now have of Teletubbies! He sits down and will watch most of it with interest. He loves how they interact with each other and the fun story lines too. Parents will be able to provide their toddlers with creative learning experiences that are fun, playful and inclusive. This DVD encourages early social skills, including taking turns, physical activity and coordination, as well as recognizing colors, objects and patterns. Join Tinky Winky, Dipsy, Laa-Laa and Po as they laugh, play, sing, dance and share big hugs. Teletubbies makes exploring and experimenting so much fun, your child will shout "Again! Again!". 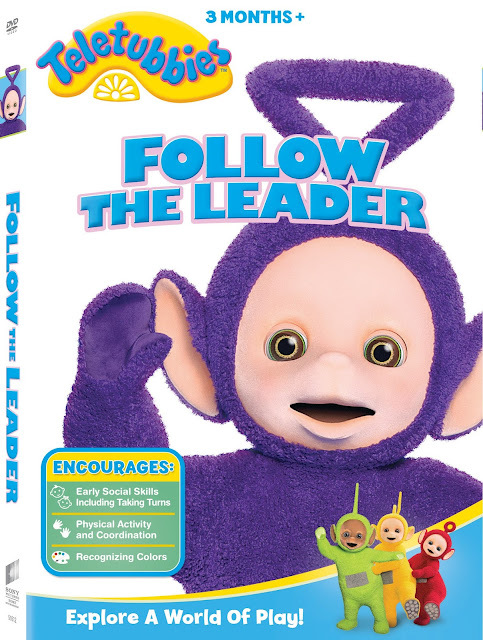 Contains six new episodes, including “Follow the Leader”.